In light of the approaching hurricane and inevitably wet and windy weekend, here's the lowdown on which DMV events are being postponed and which events will go on as planned. Hurricane Florence is headed our way with full force, and though the DMV won’t get hit the hardest, it is still so important that we take any necessary precautions and stay safe. Even if an event is going on as scheduled, please don’t go if will put you in the path of the storm and threaten your safety. Here is your weekend roundup for Thursday, September 13, through Sunday, September 16! Please note that there are several cancellations/postponements. Statement from event website: Zoo Uncorked will take place rain or shine. This page will be updated with additional information in the event of severe or unsafe weather. Love animals and love wine? There is an event on Thursday that’s perfect for you. Not only will you get to sample many delicious wines, but your ticket to the event will help animal conservation. And as a bonus, you’ll be able to visit some of the animal exhibits and enjoy them without any of the usual daytime tourists. To find out more, check out the link here. 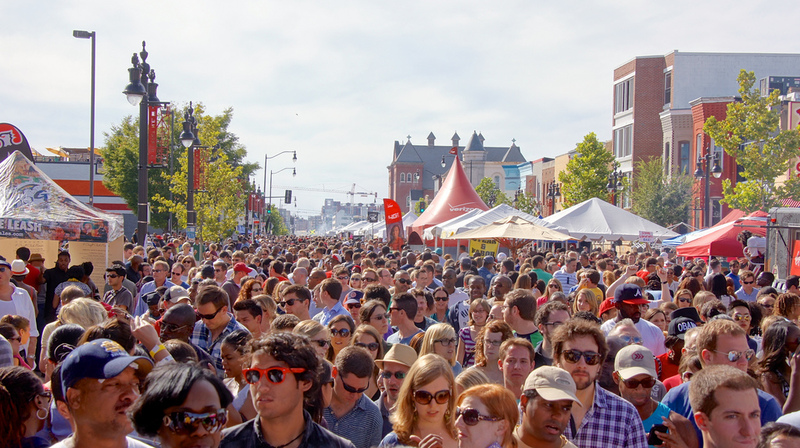 This is one of the most anticipated annual neighborhood festivals in Washington, D.C. Unfortunately (and wisely), event organizers have decided to postpone the event until October 13. Statement from event website: Due to Hurricane Florence’s expected impact on the mid-Atlantic region, we are postponing Capital BrewFest by two weeks, to Saturday, September 29th. If you've already bought your tickets, they'll still work on September 29! But if you won't be able to make it and need a refund for your ticket purchase, you can get more information here. Sadly, the annual vegan food festival, which was supposed to celebrate its 10th year, has been canceled. The Maryland Renaissance Festival is still going strong, and if you’ve never been to a Renaissance Festival before, I highly recommend you go -- at least one time. It can be quite the experience, from the food, to the events, to the characters walking around. Of course, there will be plenty of things to see and do; you’ll be believing you’re in medieval times in no time. Get the full scoop on the festival here. This wine-centered festival takes place inside, so unless it's canceled due to unsafe driving conditions, you can go! This wine festival will feature several two-hour tasting sessions with plenty of local, national, and international wines in attendance. Read more of what to expect here. This event is a great (and affordable) way to listen to live music. While there are plenty of music options in the city, there's something especially cool about going out to see a local band perform live. This Friday and Saturday, you can catch several artists in the jazz, blues, r&b, soul and similar categories at Ivy City Smokehouse. You can get the names of the artists/bands and your tickets here. This isn’t really an activity that is specifically for this weekend, but with many planned events likely getting postponed, I wanted to make sure to include at least a couple of things you can do indoors. After all, as cozy as it may feel to stay on our couch all weekend, some of us can get a little stir-crazy and may need some outside stimulation. An indoor trampoline park is the perfect way to get all that energy out and stay dry at the same time. There are plenty to choose from, and many of them have other cool activities to do as well. You can read all about some of my favorites to visit here. My last suggestion is to pick a nice, warm, comforting food, rent a movie, and snuggle with your pet, significant other, or body pillow at home. Here are my favorite pho, pizza, Indian, Russian, and Italian restaurants to get you started. What are your plans this weekend? Are you going to brace Hurricane Florence, or are you planning to hide in your home? Either way, let me know in the comments below! Looking for something different? Check out this new board game-themed restaurant in Manassas!